The Philippine archipelago is composed of 7107 islands or about 300,000 square kilometers. 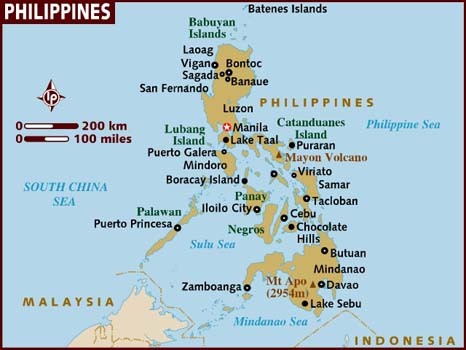 The island group is divided into three provinces, Luzon, Visayas and Mindanao. The islands are surrounded by the Pacific Ocean, the Philippine Sea, the South China Sea, the Sulu Sea, and the Celebes Sea. It is located between Taiwan in the North and Borneo in the south. More than half of the population, of the total of about 92 million people (92,337,852 in May 2010), are living on the island of Luzon, the largest island of the archipelago. Manila is the country's capital city. There are over a 100 different dialects spread over the country. The major linguistic groups are Tagalog, Ilocano, Cebuano, Hiligaynon, Bicol, Waray, Pampango and Pangasinan. English is widely used in government, business, and as a medium of instruction in schools. It is ranked as the world's third largest English-speaking country after the US and the UK. Spanish, Arabic and Chinese are spoken by only a minority of the population. There are two seasons. The Dry Season, from November to May, and the wet Season from June to October. Political, the Philippines is an democratic country with a president as the head of state. He is elected for a six-year term by the people. The congress is consisted of two chambers. The House of Representatives and the Senate. The Philippines has a multi-party system. Presently, there are eight international airports in the Philippines. The premier gateway is the Ninoy Aquino International Airport in Manila. The other international airports spread in Clark, Subic, and Laoag in Luzon Island, Cebu in the Visayas Island and Davao, General Santos, and Zamboanga in Mindanao Island handle regular flights from various capitals and service chartered and cargo planes. Philippine Airlines, the national flag carrier, and several commercial airlines fly the country’s airspace. The island of Palawan has a trunkline airport located at the Puerto Princesa while four feeder airports are located in Busuanga, El Nido, Cuyo and Taytay. Cruise liners call on the port of Manila. Inter-island passenger vessels are available to reach the different islands of the Philippines. source : Philippine National Statistics Office (NSO) and Philippine department of energy (DOE).